Nail Fungus (Poronia punctate) is a very rare fungus in the whole of Europe. 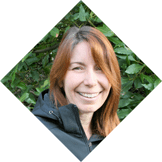 In Great Britain it is only to be found in the New Forest – so it is very special to the area and mycologists come from afar to see it. It is a small, but robust fungus, which only grows on the dung of equines that have lived on a high fibre, low nutrition diet. Because the ponies in the New Forest graze on the unimproved (or unfertilised) grassland and poor grazing under the trees, the resulting dung is very suitable for Nail Fungus to thrive. Over 3,000 ponies, owned by New Forest Commoners, graze all the year round, and the fungus can be found in the autumn, when it is at its best, growing directly out of the piles of pony dung. It is possibly to see it well into the spring, if the piles of dung have not degraded or been scattered by the birds. The fruiting body is tough and long lasting, which is unlike many other fungi that live on dung. The black dots are the openings (or apothecia) from which the spores are produced to be dispersed by the wind. The stem is black and may be long and deeply rooted into the dung. Because it is able to survive for several months, it sometimes can be attacked by a secondary infection which will cause it to become velvety and soft, which will prevent spore dispersal. It is always found on the open grassland or heathland, and has not yet been recorded under woodland trees. Since 1990, there are now a few areas in the south of England where New Forest ponies have been translocated to rough grazing on reserves to be used a conservation tool, where it may now be possible to see Nail Fungus. 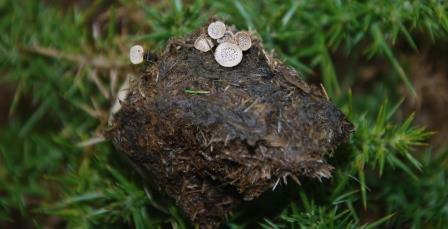 A similar fungus of the same genus, but which grows on rabbit droppings, has recently been found in the East of England, but so far has not been recorded in the New Forest. The fruiting body is shaped like a nail and comprises a flat, dull white disc covered with black dots and only 1.5cm across.